Well, it seems not everything always goes Klaus’ (Joseph Morgan) way after all. After a very dark opening episode (Andie (Dawn Olivieri) was murdered by Stefan (Paul Wesley), in order to teach Damon (Ian Somerhalder) a lesson; Jeremy (Steven R. McQueen) was haunted by two dead ex-girlfriends; Caroline (Candice Accola) was taken captive by Tyler’s mom), we get a bit more action and a hint of this show’s customary speedy plot advancement and surprise reveals. Last week Damon was discouraging Elena (Nina Dobrev) from looking for Klaus because he thought he recognized a familiar pattern. It seems that though we first met a gentle Stefan and a raging Damon, things were not always so clear cut between the vampire brothers. Flashbacks have shown us a kinder, less confident Damon, and a blood-drunk, violent Stefan. Thanks to the interference of Klaus, Damon was sure evil Stefan was back, probably for decades, and knew that couldn’t be good for Elena. Not so fast, however, and that’s not the only question answered differently this week than last. Alaric (Matthew Davis) was hesitant to move into the bedrooms of either his “dead girlfriend” or Elena’s “dead parents” in her family home last week, and so ended up boarding elsewhere. Which is where Elena finds him this week when she needs his help, and not only does he sign on, he eventually moves into the parental bedroom. Depression over your girlfriend (whom you lied to about all the vampires and werewolves in town, thus leaving her vulnerable to their tricks) being killed, vamped and killed again is understandable … but Ric is a father figure to the Gilberts whether he likes it or not, and there’s no way he’s getting out of that responsibility. As Elena reminds him, her family is destroyed. Subtext: so she’s building a new one, one live body at a time. Her brilliant plan is to track Stefan in Tennessee, never mind that he and Klaus are hanging with a literal wolf pack and tonight is the full moon. She figures they’ll find him before the sun sets, which is really poor thinking, actually, but that’s Elena’s secret power: she can talk anyone into anything, as long as it sounds right, and I guess that’s how she’s hoping to free Stefan from Klaus. This happens largely off-screen, as we’re more concerned about Alaric, Elena and Damon (yeah, he figured out what was happening and trailed them) in the woods with the few rabid wolf vamps that make it out of the camp. 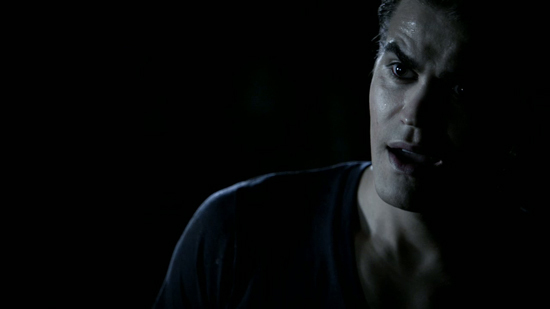 And things would go pretty badly, if not for Stefan saving his brother, like always. This lets Damon know, of course, that Stefan can be saved, after all. They’ve just got to deal with the Klaus situation. My advice: find the way cooler Elijah, and let him loose. What could be better for this show than a double-brother-on-brother battle to the death? In other threads, Jeremy and Matt (Zach Roerig) dither about doing a séance to call up Vicki (Kayla Ewell) and Anna (Malese Jow), and the two pot-head waiters make a hilariously daft version of the Hardy Boys, whose good sense is clearly trumped by their chaotic emotions. I don’t know where this is going, but I’m all about the haunting, and it’s good to see Season One characters again. And Caroline wakes up in captivity, because Carol Lockwood (Susan Walters) has called in her own vampire hunter, who turns out to be … no, not just Caroline’s father, but also Claire’s father, from Heroes! There’s something beyond ironic about Jack Coleman, once TV’s first gay son on Dynasty, now becoming the supernatural patriarch of choice on genre shows. Bringing in a real actor for the role means we’re probably going to find out more about Mystic Falls early supernatural legacy, but I don’t see this dad betraying his little blonde angel any more than Noah could ever do to Claire. 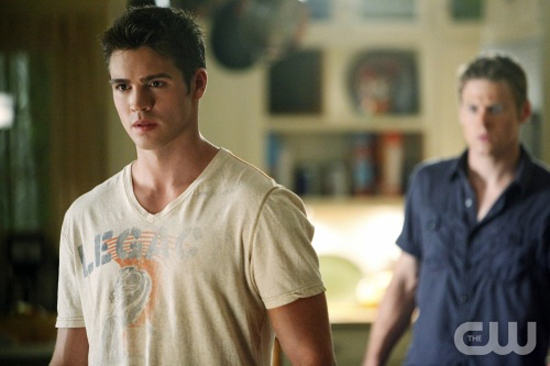 The Vampire Diaries 3.02 "The Hybrid"